Premier Houseboats are pleased to present Sheila Rose, a beautiful widebeam narrowboat built by Collingwood in 2016, fitted out to an extremely high standard and available on a secure residential mooring. The layout of Sheila Rose has been well thought and completed to a high specification, ensuring comfortable living space throughout, and can be a cruising home, static home or a mixture of the two depending on your preference. The main living area is a delight, with plenty of headroom and light, and extremely spacious. The kitchen area has a fantastic amount of storage and work top, and comes with built in gas oven and hob, fridge, freezer and washing machine. The spacious saloon area has a lovely multi fuel burner that can compliment, or be used instead of, the full Webasto central heating. The boat can come fully furnished if required. The shower room houses a toilet, hand basin and large shower cubicle, together with plenty of storage. The double cabin is again spacious, with built in bed and again plenty of storage. The covered wheel house area provides both an excellent navigation point, and plenty of seating to enjoy the surroundings wherever you may find yourself. The 70hp Barrus Shire diesel engine provides plenty of power for cruising, and the 240l fuel tank, 425l water tank and 250l blackwater tank give you the ability to travel tidal or non tidal waterways. 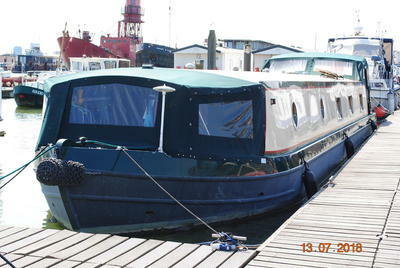 Externally Sheila Rose is in excellent condition, and has just had new anodes fitted. Overall, Sheila Rose is a stunning example of her type, the attention to detail and finish are excellent, and on a secure residential mooring that enables you to live on her full time or part time. Vessel name: Sheila Rose Vessel condition: Excellent Builder: Collingwood Make: Collingwood Model: 60 Widebeam Year constructed: 2016 Berths: 2 Cabins: 1 Heads: 1 No. of engines: 1 Engine model: Barrus Shire 70 Engine power: 70 Fuel type: Diesel Length over all: 60' Beam: 12' Maximum draft: 2' 5" Hull material: Steel Hull type: Flat Displacement: 26 metric tons Dry Weight: 26 metric tons Fuel capacity: 240 Litres Water capacity: 425 Litres Holding tank capacity: 250 Litres Disclaimer Premier Houseboats offers the details of this advert in good faith as it was presented by the seller or his representative but cannot guarantee or warrant the accuracy of this information nor warrant the condition of the described item within this advert. A buyer should instruct his agents, or his surveyors, to investigate such details as the buyer desires validated. The Item described within this advert is offered subject to prior sale, price change, or withdrawal without notice.